Australian Brandenburg Orchestra, presents HANDEL'S MESSIAH, in the City Recital Hall, Angel Place, Sydney. March, 2017. 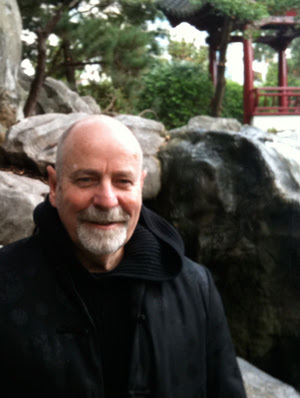 Paul Dyer, leader of the Australian Brandenburg Orchestra, has invited a young theatre Director, Constantine Costi, to prepare, with him, a performance of George Frederic Handel's, MESSIAH. In a speedy two hour performance, including interval, this great and famous English Oratorio, has all barefooted - orchestra, chorus, soloists and conductor - perhaps, that the reason for fleet-footed tempo. THE BAREFOOT MESSIAH, in the City Recital Hall. Handel always intended his oratorios as entertainment, to be performed in playhouses and theatres, and they were never meant to be sung as a part of a church service. MESSIAH, was first presented in Dublin, 1741, after a swift composition of 24 days by Handel, using the scriptural text by Charles Jennes. When first presented in London, a little later, it was not much appreciated. History has reversed that original London reception to make it the most performed work in the Handel repertoire. Handel finding a public reaction against the Italian Opera form and appreciating the 'satire' of the popular hit of the John Gay and Johann Christoph Pepusch's THE BEGGAR'S OPERA, (1728), he began to write Oratorio as a money making alternative. He wrote his last opera, as in 1741, after its failure, the same year as MESSIAH. It resembles opera but is not written in dramatic form. The singers do not assume dramatic roles, the writing is not to dramatise the story but, rather, to acclaim the "Mystery of Godliness", through the stages of Christ's Nativity, Passion, Resurrection and Ascension. There is no impersonation of character or direct speech. 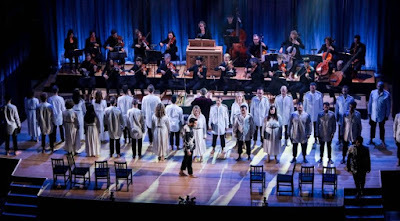 The semi-staging of this work by Mr Costi in collaboration with Designers, Genevieve Graham and Charlotte Mungomery, with dramatic lighting by Peter Rubie, is scattered across the stage, even up to the height of the organ platform, and around the floor level of the auditorium, with one startling aria from the Bass singer, David Greco, from a side-on first level balcony lean-over. Not all could see him, without risking life and limb, and goodness knows what the sound was like in the many different places of audience in the hall. What was gained as theatre was not always a bonus for the music and singing, for all. Some of the staging of the barefooted, costumed soloists, gave the 'sacred' texts the appearance of a 'seduction', of dramatic love-making between singers that shifted some comprehension - appreciation - of the Oratorio, definitively away from 'sacred' contemplation, to distracting 'secular' provocations. The Brandenburg Chorus sang well and carried off their staged movements with great discipline. The production, then, had wins as well as losses. This presentation will be appreciated, vastly, along lines of personal taste. I was, unusually, underwhelmed by the performance. Whether it was the 'editing' of the material or the theatre staging, I cannot say. The program notes tell us that before the original London performance, "scheduled, by Handel, for the 23rd March, he was attacked in the newspapers by those who were scandalised by 'a religious performance in a Playhouse', and the performance was ' but indifferently relished'", and it was not until 1750 when it was performed as a charity fundraiser at the Foundling Hospital orphanage that MESSIAH really took off in its popularity. Mr Dyer, was energetic with his Musical Direction, and kept his orchestra at a robust tempo, his choir attentive and eager. Lucia Martin Carton, a young Spanish soprano, Nicholas Spanos, a Greek countertenor, Kyle Bielfield a tenor from the USA, and David Greco, an Australian Bass carried the joint responsibilities of theatre staging and singing with aplomb. Mr Greco, for me, especially impressive. Interestingly, Glyndebourne's 2015 production of SAUL, an oratorio by Handel from 1738-39, Directed by Barrie Kosky, is to be seen at the Adelaide Festival, in a full operatic 'cry'. It is, supposed to be tremendous. Check the Adelaide Festival electronic site. 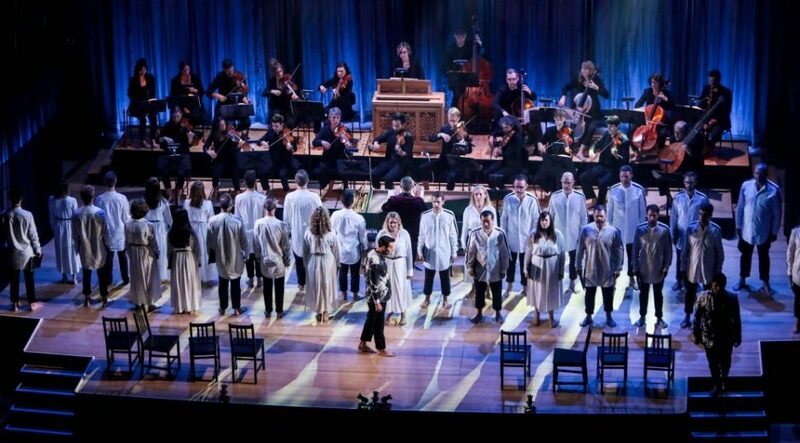 This theatre staging of MESSIAH, is, in contrast modest in its vision. Modest in its overall success, too.